Empress of the Fall (2016. 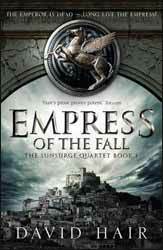 668 pages) is another intricate fantasy tome from David Hair. Honestly, I would suggest that readers do not start here. Rather than being a new series the novel is a continuation of The Moontide Quartet set of books. This means that there is a lot of information and history to catch up with and the sheer number of names and places initially thrown at the reader makes the beginning of the book quite a daunting prospect. Hair has evidently seen that there is an audience out there for fantasy which has a good and understandable connection with our own world. George R. R. Martin chose to base his books on the War of the Roses, Hair on the crusades, although the enmity between east and west could just as well draw on any number of historical periods. Hair has taken this bare bone idea on which to build his world of Urte, a place of magic, some allowed, some proscribed and some inadvisably forgotten, leading to questions about how many of the puppet masters are puppets in a greater game. If the book has a flaw it's the multiple viewpoints from which the story is told. As a device, this worked well for Martin and for some reason I can’t quite put my finger on it does not work as well here. That said, there is little to complain about this epic. In scope and size, it deserves its epic title with a good supply of politics, gore and a well thought out magic system, but its reliance on previous knowledge makes the first part of the book a bit of a slog.